Home / Albums / Artist / Ditto / EP's / Music / Music Distribution / Rich Cottell / Singles / YouTube Artist / Rich Cottell explains how to professionally release your music! Rich Cottell explains how to professionally release your music! So, you've written a song, you've recorded the song professionally, you've made a video for the song and uploaded it to YouTube and now you want to sell your song or make it available for streaming on Google Play Music, iTunes, Spotify, Deezer and so on, but are unsure how. 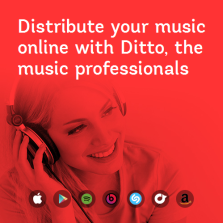 Rich Cottell explains how he professionally releases his music in this walkthrough video as he uploads one of his latest songs to music distributor Ditto Music. There are many music distributors out there, so which one you choose is down to you. How to go about the process will be pretty much the same for all of them though, so even if you choose a distributor other than Ditto, you could still find this video useful. Having used Ditto myself a few years ago, I am impressed with how easy it now is through them. The first few times I used it, things did not go smoothly. Then they updated their website which helped a lot, but now it looks easier than ever. Is your music spread over multiple Spotify pages?